[0:09] <wolfram74> query, are the ip addresses in the 10.~.~.~ block exclusively lag addresses? [0:10] <undecim> ozzzy: Does restarting wicd work? [0:11] <Bushmills> some mobile providers use address from that block for their customers. [0:13] <wolfram74> how would i check firewall settings? [0:14] <wolfram74> would those be rooted in the Pi, or on the wireless router/ethernet router? [0:17] <SpeedEvil> gordonDrogon: No, that's with the AC off. With AC on, it's more like 50 hours. [0:17] <gordonDrogon> SpeedEvil, sounds good. [0:17] <wolfram74> so, "run tcpdump" and then...? [0:19] <wolfram74> how would i send things via that port? [0:20] <wolfram74> would i need a computer not being serviced by that router? [0:21] <wolfram74> tcpdump is giving me "no suitable device found"
[0:24] <gordonDrogon> otherewise you'll get swamped with your own ssh traffic..
[0:24] <wolfram74> i've tried "sudo tcpdump -n -i eth0 dst port 64738 "
[0:25] <gordonDrogon> will give you the fine manual. [1:13] <jaha> anyone know a well semi maintained node.js library for raspberry pi? [2:10] <Danith> whats the 5v on the gpio pins for? [2:10] <Danith> powering the pi? [2:10] <malcom2073> You can power the PI by this, yes. [2:15] <Danith> should i put a resistor between grnd and the - rail on a breadboard? [2:16] <pksato> on a symetric power source? [2:17] <pksato> all gnd ou common power lines are interconected. [2:18] <pksato> if you use a psu for rpi and other to you borad, both gnd are conected. except if have some kind of isolator. [2:27] <Danith> whats the command to activate the gpio pin again, export (pin #) > /proc/? [2:35] <Danith> a resister between the gpio and the buzzer? [2:38] <Danith> you think those are 12v? [2:38] <malcom2073> He said current, not voltage, but that too. [2:39] <Danith> any ideals why it doesn't seem to be using the gnd? [2:40] <pksato> Danith: get some basic eletronic text before you blow up RPi, and you house. [2:42] <pksato> get a 3v batrery (coin tipe, or 2 AA or AAA), and try to power the buzzer. [2:44] <pksato> probable, you RPi now are damanged. [2:47] <ozzzy> between 3v and +??? [2:48] <pksato> last night I fly two power transistor and on IC. allways check that you doing. [2:50] <Danith> when I use that mode on a multimeter that tests for connection, shouldn't it still beep with a resistor? [2:51] <malcom2073> Likely not, depending on the size. [2:51] <Danith> how do I turn on the 3.3v pin? [2:52] <ozzzy> why did you put an led in? [2:55] <malcom2073> Danith: If you put an LED without a resistor inbetween 3.3v and ground, it will break things. [2:56] <Danith> what kind of things? [2:57] <hyperair> hmm, the pi doesn't do any current limiting? [2:58] <Danith> ya, I'm betting because it took all the current? [2:58] <malcom2073> Danith: you likely browned out the power supply. The buzzer was probably trying to pull too much current. [2:58] <pksato> Danith: that kind of buzzer? [3:00] <pksato> its is not a buzzer, only a little speaker. [3:01] <pksato> this speaker have a low impendance (8 ohms) can damange RPi. [3:07] <Danith> can the current be too large if it's just being powered by the usb of another computer? [3:10] <mgottschlag> hm? what is it? normal speaker? [3:11] <pksato> but. to make buzz noise, need to send a square wave. [3:12] <ShorTie> no number on it you could google to see what your playing withn?? [3:18] <pksato> page 3 show how to connect a uC. [3:27] <hydroxygen> ask the doctor when u see him..
[4:16] <shiftplusone> jvboy, no, heat sinks are only there to get money from the gullible. [4:16] <ricksl> It really isn't as far as I can tell, I overclock it high and never use one. [4:16] <shiftplusone> not only are they not needed, they don't do anything either. [4:18] <ricksl> forgot all about that. [4:19] <jvboy> there's no need then? [4:44] <ricksl> You guys might be right, but which is easier to replace? [4:45] <Scriven> Ok, can anyone point me to what I should install for a full, modern build environment? I've got wiringPI downloaded using gordonDrogon's git instructions, but the build script failed for missing gcc. [4:45] <Scriven> is 'build-essential' all I need, or should I add autoconf, automake1.9, ... ? [4:47] <Scriven> Do I need to worry about specific autoconf/automake versions? specifically I'm being suggested autoconf2.13 and automake1.9 in addition to your suggestions. [4:50] <Scriven> also added debian-keyring and libtool to that list, in case anyone else is following along. [4:51] <Scriven> is it just a little-bit wrong, or is it wrong by a time-zone or something? [4:59] <Scriven> blinky leds, how I love thee. [5:00] <ParkerR> To compile an image? [5:01] <daveZzZ> damn me for my ignorance. [5:02] <ParkerR> daveZzZ: Compile or writing the image to an SD card? [5:41] <Scriven> with my blinky leds I will rule the world! MUAHAHAHAHAHAHA! [6:48] <joako> Is there any ready to go toolchain to compile for Raspbian Wheezy from Debian Wheezy? [7:28] <gtroy> anybody offer recommendations for automation ideas with the rpi? [7:38] <joako> gtroy, Bootable ISO that lets you compile for rpi from x86 PC. [7:42] <gtroy> does virtualbox support arm? [8:20] <BoomerET> I want to try hooking up a small screen, anyone tried gameboy color screen, maybe gameboy advance? [8:21] <BoomerET> Hmm, I have a NDS that got dropped in the sink too. [9:03] <SwK> anyone know of a good SPI sound chip with both input and output at 16 or 20 bit resolution on the ADC and DACs? [10:09] <gordonDrogon> SwK, biggest issue there is going to be the Pi's latency on SPI accesses - you might get just over 8K samples/sec if lucky. [10:27] <zerkman> what's the maximum size for openGL ES 2.0 fragment shaders on the Pi ? [10:33] <Zitter> hi, do you think it is possible to use this http://www.adafruit.com/products/751 with Raspberry PI? [10:35] <histo> Zitter: if it's just a serial interface I suppose so. [10:42] <Zitter> yes, but library? Do you think I can use same used for arduino? 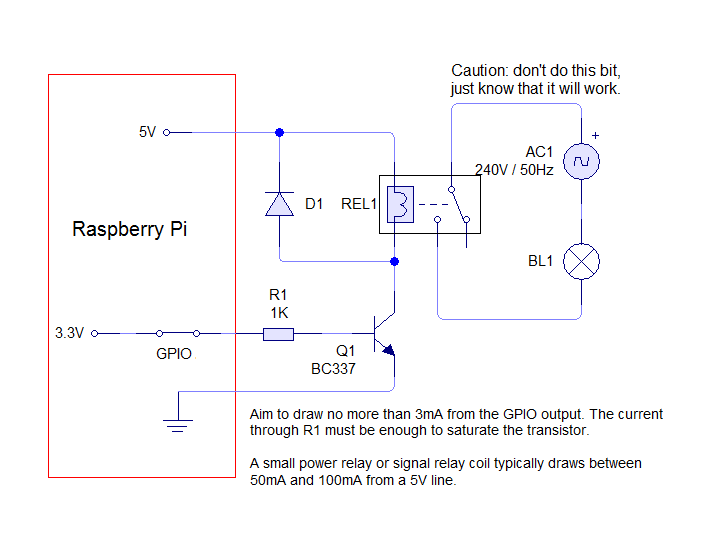 [11:00] <histo> What kind of output amperage can you pull over GPIO 5V or usb on the pi? [11:01] <gordonDrogon> milliamperage more like. [11:01] <gordonDrogon> stick to under 200mA and you'll be fine - unless you're also powering USB peripherals. [11:02] <gordonDrogon> Jck_true, the Pi serial port can be configured to run at any baud rate without recompiling the kernel. [12:57] <psiklops> Hi. I would like to put the Noobs zip on 8GB SanDisc. I have no Windows to do the copy to Disk. How would i go about in Linux? [13:00] <gordonDrogon> what do the instructions say? [13:03] <psiklops> gordonDrogon, thats it? [13:04] <gordonDrogon> I guess it's aimed at windows users then. [13:05] <gordonDrogon> I thought the idea of noobs was just to make it easy to do a single install of a number of systems? [13:07] <gordonDrogon> just re-read - you can return to the noobs menu and then install another OS, or re-install the current one - on-top if it. [13:07] <gordonDrogon> so it sits on a FAT partition on the SD card and does what it needs to do with the rest of it. [13:10] <dreamreal> gordonDrogon: ever try pidora? [13:18] <gordonDrogon> I've been using Debian myself for ~18 years now. [13:19] <gordonDrogon> I've just not had the time or inclanation recently to look at the various RH type offerings. [13:31] <gordonDrogon> too many things to do..
[14:58] <Brandano> I have just got a model B board, and got raspbian running fine with the NOOBS installer. But apparently the ethernet interface doesn't want to acquire an IP address via DHCP. I see no errors or dropped packets, though. Any known pitfalls I should look for? [15:01] <Brandano> and naturally out of the box rasbian has ui tools to set wlan interfaces, but none for the ethernet? [15:03] <Brandano> eth0 is still an usb device, right? [15:03] <gordonDrogon> Linux will assign a link-local IPv6 address though. [15:05] <gordonDrogon> I don't know about the noobs system, but if you install raspbian 'normally' then you can usually do it via ssh. [15:05] <gordonDrogon> I'd be tempted to get the standard raspbian image and DD it to an SD card and boot that..
[15:06] <pksato> Brandano: a headless rpi? [15:07] <gordonDrogon> Brandano, what is the output of the mii-tool command? [15:10] <IT_Sean> Yes, but none of those ever got into the wild, i believe. [15:12] <pksato> Brandano: is a home network, or work place? [15:14] <pksato> Brandano: set manual ip, like you other host+1 or -1 . [15:16] <gordonDrogon> I'd be surprised if there was a Pi clone - mostly due to the issues getting the chips. [15:16] <gordonDrogon> AVR sell ATmegas on the open market. Broadcom don't. [15:16] <pksato> no more leases on dhcpd pool ? [15:18] <Brandano> can I power the board through the same powered hub that I am using to extend the USB ports available? [15:18] <Brandano> I mean, the micro-usb is only a power connector or will it cause some sort of nasty loop? [15:22] <Brandano> well, just the PI and a wireless keyboard adapter to start with. On a 2A psu it ought to be enough? [15:25] <histo> Brandano: will the hub do 2a? [16:30] <gitterrost4> Hi, has anybody managed to get jdownloader running on a raspberry pi? [16:36] <factor> also can you run java on the commandline "java" by itself does it give you errors. [16:43] <factor> Yes I would try it first. [16:49] <Hoerie> isn't there and openjdk one? [18:42] <wroberts1> gpio readall uses sys mode or no? [19:28] <shiftplusone> Pinas, what's your pc running? [19:51] <shiftplusone> There's owncloud, which has a media player plugin, but in my experience it's a bit too slow on a pi. [19:53] <tfinnamore> any of you guys have experience with MediaTomb on the pi? does that run well, assuming you arent transcoding? [19:58] <Pinas> i just found resplex - anyone has experience with that ? [20:13] <pecorade> Good afternoon, knob. [20:14] <knob> How's it going over there pecorade ? [20:15] <pecorade> knob, well. I've just finished to install Windows 8. [20:15] <knob> It's a very nice OS. I prefer fBSD, yet w8 is very good. [20:16] <pecorade> Classic Shell? Let me google that. [20:18] <HonkeyGenius> i have win8 on my laptop. i don't use any metro aps (don't see a point to them). only need the desktop and lack of "start menu" is no biggy as the start screen works fine. [20:18] <navaismo> Hi is there a way to use al pins as Digital IO? [20:23] <pecorade> knob to be honest i've burned a FreeBSD 9 DVD recently but still i don't have enough free time to play with it. [20:26] <navaismo> pksato, thanks any url to read more about that? [20:27] <pksato> navaismo: any advanced math book. or for dsp. [20:29] <pksato> gordon site too. [20:36] <steve_rox> any interesting pi stuff going on? [20:40] <SpeedEvil> The end number is a 3. [20:40] <SpeedEvil> After that, it's all 0s. [21:20] <D0nta> hey, I am looking to purchase a rpi to use it for vpn, znc, file server, and maybe a few other things... can it handle that much? [21:21] <D0nta> also is there any reasons to use a heatsink fan on it? [21:22] <IT_Sean> D0nta: it'll work for light home server use. [21:22] <gordonDrogon> no heatsinks needed. [21:22] <IT_Sean> and No, you do not need a heatsink. [21:22] <D0nta> IT_Sean: can it run those processes I listed above at the same time for personal use? [21:23] <D0nta> also does raspberrian have built in gpg that I can use over ssh? [21:24] <D0nta> gordonDrogon: will a case cause any heat issues? [21:27] <D0nta> " found that with no cooling it would run around 52 degrees. With just the heat sink it would run around 47 and with both a heat sink and fan around 36 degrees." [21:28] <IT_Sean> You. Don't. Need. A. Flozzing. Heatsink. [21:29] <IT_Sean> The only purpose behind raspi heatsinks (except for the extreme cases of serious overclocking) is to separate idiots from their money. [21:29] <D0nta> IT_Sean: do you know about gpg? [21:31] <quackgyver> RaspberryPi + Wireless keyboard/mouse trackball = the only time I've ever had use for a hotel TV. [21:33] <D0nta> Ely_arp: you run a heatsink? [21:33] <Bushmills> very suitable cooling equipment for raspberry, albeit a bit on the expensive side, are peltier elements. [21:34] <Bushmills> "at 950 mhz "
[21:35] <Dataless> Anyone experienced issues PI/wheezy running on a lan with existing netBIOS protocol and causing random communication drops for other devices? [21:35] <Bushmills> who cares. they cool. [21:35] <D0nta> are there any cool server related projects that use breakout boards? [21:37] <IT_Sean> There are plenty of people doing that sort of stuff. Not sure i'd calssify it as a "server" rpoject, though. [21:37] <D0nta> IT_Sean: which do you find to be the coolest? [21:40] <D0nta> python comes built into pi, correct? [21:42] <shiftplusone> No, but the official raspbian image comes with python pre-installed. [21:44] <Ely_arp> Bushmills is 950 mhz too high? [21:45] <D0nta> IT_Sean: how do you keep it at 1Ghz stable if you don't use a heatsink/fan? [21:46] <Bushmills> how do you keep it stable at 1.6 GHz without liquid nitrogen? [21:47] <shiftplusone> D0nta, The pi 'should' be perfectly fine at 1GHz without any cooling. [21:47] <Dataless> has anyone monitored the Pi's traffic with Microsoft Network Monitor? [21:48] <D0nta> ozzzy: is there any need to run them higher than 700Mhz if you're only running personal stuff (BNC, file server, VPN)? [21:48] <shiftplusone> yes, that's all the advertised clock rate means really... that it has been tested and is stable at that frequency. [21:49] <D0nta> K, well, if it shouldn't have any trouble running what I need, I'm going to order one! [21:49] <ozzzy> you mean you don't have one? [21:51] <shiftplusone> tfinnamore, correct. It's not actually 'ondemand' it's one provided by broadcom, but it's meant to do the same thing. [21:51] <D0nta> ozzzy: what do you use it for? [21:55] <FR^2> Not really a raspberry topic, but is there a way to connect a serial port (ttl) to a bluetooth module and connect to that using bluetooth serial profile? [21:56] <D0nta> do the micro wifi dangles get good reception? [21:56] <D0nta> or should I upgrade? [22:02] <D0nta> in the USA is Newark (element 14) the best place to buy? [22:03] <D0nta> do you know what shipping runs? [22:21] <Dataless> Anyone experienced issues PI/wheezy running on a lan with existing netBIOS protocol and causing random communication drops for other devices? [22:36] <daveZzZ> can i run linux in virtual box? [22:40] <daveZzZ> which linux should i use ? [22:42] <shiftplusone> It really doesn't matter what you choose. [23:01] <BonaC> What is the "proper" way to install plugins? [23:02] <IT_Sean> besides "veeery carefully" ? [23:03] <BonaC> I get error "Script failed:yleareena.py"
[23:03] <BonaC> So, I need some other python package? [23:25] <chaotix> what distro would be best for a todler for raspberry pi? [23:26] <chaotix> i was thinking raspbian, with chrome maybe, so he can play flash games? [23:36] <tos9> qimo. that's the one. Doesn't look like they have an ARM version unfortunately. [23:36] <tos9> raspbian's probably fine. [23:40] <mdik> which external component is cheapest/easiest to install? [23:41] <pksato> mdik: it is not easy. [23:44] <pksato> to do it easy, buy a gertboard or piface module with adc. [23:45] <mdik> ok. and the hard way would be an arduino/microcontroller hooked up to uart? [23:45] <pksato> mdik: RPi dont have a ADC. [23:46] <pksato> need on external. arduino is one of way to have adc. [23:48] <pksato> for slow and not precise application, a simple adc can be implemented using one or two digital pins. [23:51] <mdik> daveZzZ: nice. thank you! [23:52] <mdik> pksato: and how would i do it with the digital pins? [23:53] <gordonDrogon> it hooks to the SPI bus.